Thick, soft and buttery, these Soft & Chewy M&M Chocolate Chip Cookies are completely going win you over. 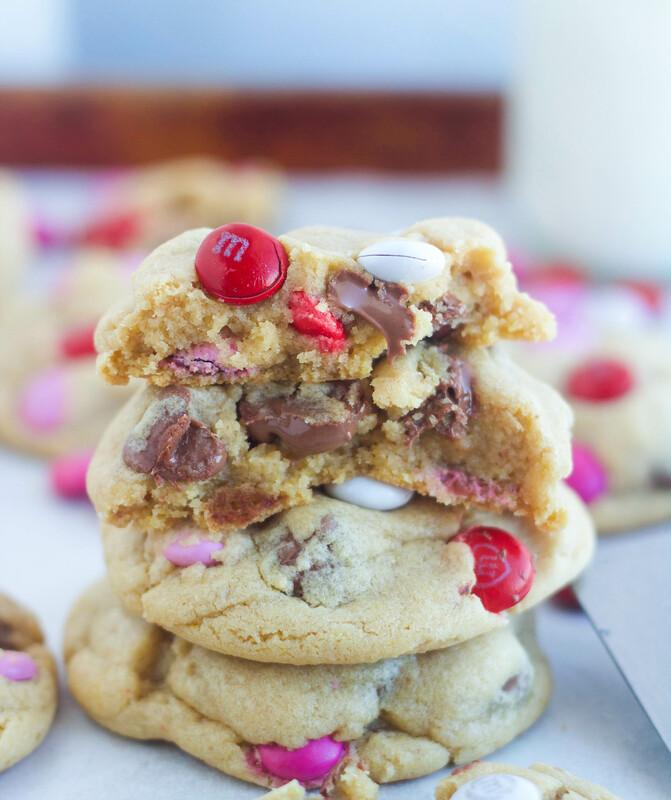 They’re loaded with M&M’s and chocolate chips. . . does a cookie get any better? The Super Bowl is over (and what a dud that one was!) which means it’s time for some red & pink treats! 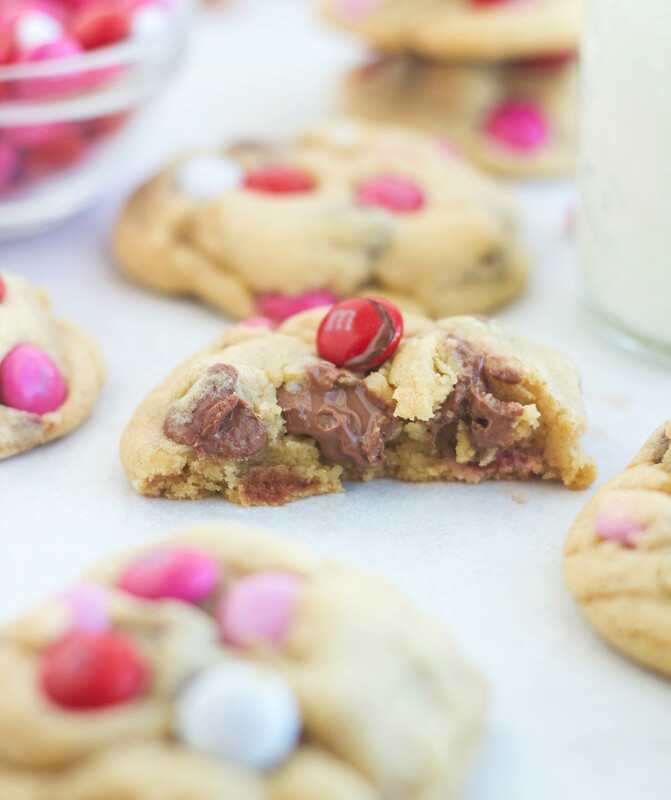 These Valentine Soft & Chewy M&M Chocolate Chip Cookies are going to quickly become a favorite! These are buttery, soft, chewy and packed with M&Ms and chocolate chips . . .they’re basically perfect! You all know chocolate chip cookies are pretty much my life, and I make them way more than I probably should, but that’s beside the point. I just don’t think it’s possible to have too many chocolate chip cookie recipes up your sleeve, so today I’m sharing these Soft & Chewy M&M Chocolate Chip Cookies. 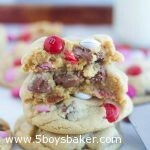 I used valentine M&Ms in these, but obviously you can make these year round using any holiday or regular M&Ms that you want. I love using milk chocolate chips in these cookies and Guittard and Ghiradelli are my absolute favorite milk chocolate chips ever (Guittard are my first pick always!). I love them not only because they’re good quality chocolate chips and taste amazing, but also because they’re bigger chocolate chips, which obviously means more chocolate! If you’re a semi-sweet fan, then by all means use semi-sweet, it’s totally up to you, or use both if you want. I do like to mix in the M&M’s by hand so they don’t get crushed, but if you’re feeling a bit lazy and want your mixer to do the work, then just keep it on low and only mix them in for about 20-30 seconds. In the bowl of an electric mixer combine the butter, sugars, egg, and vanilla and mix until creamed and well combined, about 3 minutes (scrape down sides of bowl as necessary). Add the flour, pudding mix, baking soda, baking powder and salt, mix on low speed until just combined, about 1 minute. Add the chocolate chips, and beat on low speed until just combined, about 30 seconds. Add M&Ms and mix in by hand until combined. Using a cookie scoop or your hands, scoop balls of dough using about 3 tablespoons of dough. Place about 2-inches apart on cookie sheets that have been lined with parchment paper sheet) and bake for about 10 minutes, don't overbake (they will still look slightly undercooked). Allow cookies to cool on baking sheet for about 5 minutes before transferring them to a wire rack. Make sure you don't overpack your flour when you measure it, that's really important for this recipe. It's a fairly stiff/thick dough, so you don't want to over measure the flour and make the dough any stiffer. Make sure you scoop it and then level it off with a knife. Don't shake the measuring cup to level it off. The great thing about these cookies, is you can change them up for any holiday by using holiday color M&M's or just use regular M&M's. This is a fairly thick dough (meaning it isn't super wet), and doesn't really need chilling time, but I will sometimes chill the dough for 30 minutes. This just keeps the cookies even slightly thicker which I love. If you prefer a little bit flatter cookie, then make sure you gently flatten each dough ball with the palm of your hand before baking them. 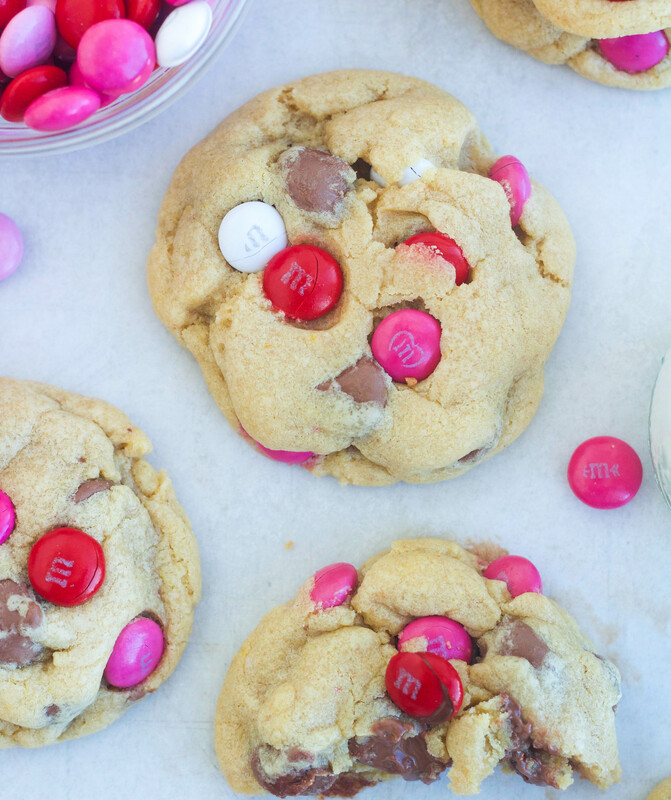 You can place a few extra M&Ms on top before baking these cookies.